Cable Barrier Delineators are easy to install and come with either a secure flange-bracket attachment to post, or direct, self-tapping crew attachment. Cable Barrier Delineators raise the reflective material above the cable barrier making it more visible during dim light scenarios and inclement weather such as heavy snow build-up. 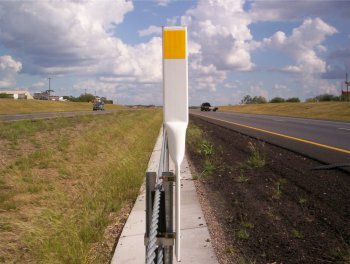 The Cable Barrier Delineator is made from recycled materials and is economical and durable.